I’m coming down from one of the most epic book hangovers of my entire life, which means that I’ve been waiting for the proverbial other shoe (or, in this case, the other book) to drop. I knew that, even if it was an altogether entertaining book, if it didn’t obliterate my feels, it would seem much worse to me by comparison. 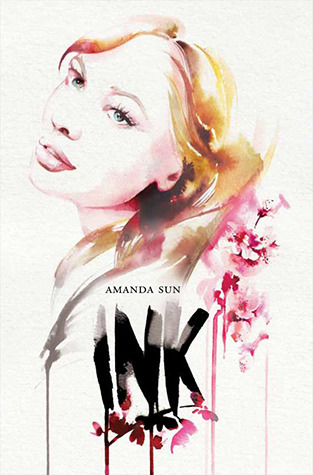 Sadly, this is the case with Amanda Sun’s Ink, the first in the Paper Gods series. It had all the pieces of something I would enjoy, but somehow those pieces didn’t fall together. In Ink, Katie Greene has left New York following her mother’s death to live with her aunt in Shizuoka, Japan. She doesn’t know the language, she’s unfamiliar with the culture, and she doesn’t know her aunt well enough to feel at home. One day at school, she witnesses a very, very bad break-up that sticks with her because a- the boy doing the breaking says terribly mean things but looks as though the words hurt him and b- pictures from the boy’s sketchbook fall into Katie’s line of sight, and those pictures move. She gets a ton of shade thrown her way by this mysterious and dangerous boy named Yuu Tomohiro about how pictures don’t move, but she refuses to back down. Her new friends tell her to back off, but she can’t help herself. She discovers Tomo’s secret—he’s part-god, a Kami whose drawings come to life with frightening results—and his drawings and the “ink” respond to her. So here’s the thing—there’s a lot going on in Ink. At any point, it may be a supernatural romance, a thriller, or a fish-out-of-water tale. The problem was that I never felt these separate aspects coalesced like they should. The focus wouldn’t stay on one topic long enough for me to feel sated in what I’d read before it would leap to something else. By the end I felt things start to gel, the book was nearly over. I knew what I was supposed to feel—that was evident from what was happening on the page-- but I didn’t feel the characters had earned it. It’s a shame, because there are some really well-written, lovely descriptions of Japan that showed so much potential. Then, there’s Katie and Tomo. First, there’s an unnecessary love triangle that felt more forced than anything. Secondly, I understood why Katie would be interested in following Tomo around after the break-up incident, but after finding out the tales of horror from his past and learning about the people he associates with (like, Yakuza gang members! ), I wish she’d have taken more time to consider that he might actually be dangerous. She just wouldn’t let up. This doesn’t happen to me often, but I think this is one of those times when I am not Y enough to fully immerse myself in this YA. Katie kept making so many irresponsible choices with no regard for anyone around her, which shouldn’t make or break a character, but I didn’t feel bonded with Katie. I could see how other people could really enjoy the Paper Gods series and its first novel Ink, but unfortunately, I don’t think it’s for me.